Abnormal tone in the psoas muscles can create imbalances in the pregnant body that may contribute to discomforts and impact fetal position. While there are many approaches to “releasing” the psoas, many are aggressive, painful, and often counterproductive long-term. Come to learn to release the psoas during pregnancy without touching it and without pain. The need for respect and gentle approaches is particularly important with the pregnant body. In this hands-on intensive we will also work on techniques to unlock an immobile sacrum, and mobilize the lumbar spine. Equally important we will address how to rehabilitate the psoas postpartum as well without causing pain to the client. This workshop is ONLY for experienced, certified bodyworkers as the techniques taught can be harmful inappropriately applied or if contraindications are present. The psoas is the deepest and most sacred muscle of the human body. Working with this muscle means touching the physical, emotional, and spiritual centers of the person you are working with on your table. In this class you will learn a variety of techniques to create functional wellness in the psoas. Surrounding structures will be addressed as the psoas is influenced by its’ supporting soft and hard tissues. 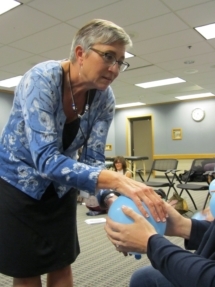 Some of the techniques covered will include: craniofascial unwinding, fascial release techniques, proprioceptive neuromuscular facilitation, motor gamma neuron stimulation, and more. By the end of the class you will have the tools to release a psoas without touching it physically, and be able to release it manually without causing pain to the person needing the assistance to access their psoas.